Falsified death certificates and medical records by Eleanora I. McBean, Ph.D., N.D.
Wallace, LL.D. 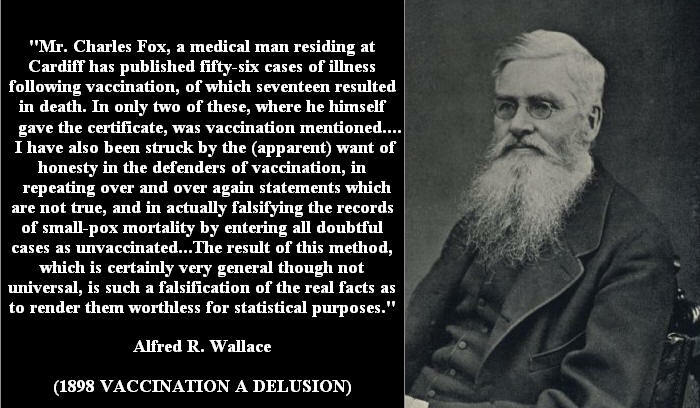 (1889/1898, Alfred R.
VACCINATION BE RIGUEUR. Dr. Whitefoord writes:—" I was called to see an infant on September 18, aged twelve weeks, the son of Mrs. Darling, of 222, Euston-road, who had been vaccinated six days previously. The mother stated that she received two threatening notices to enforce the vaccination of her child, and, although delicate, the operation was performed. Subsequently the child refused food, wasted, and died on the seventeenth day. The vaccinated arm, well hacked in four places, wasted more than the other arm.